Community researchers investigate soybean crops with Dr. Sieg Snapp. Photo by Dr. Sieg Snapp. 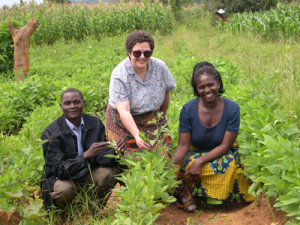 We focus on agroecology in sub-Saharan Africa, primarily Malawi. We are committed to a “community of practice” approach, interacting and earning from each other to build capacity for adaptation to global change. Challenges: Climate change, resource (soil) degradation, population pressure and shifting smallholder demographics, low agricultural productivity, poor access to inputs and nutrients, food insecurity and poverty, highly variable physical and socioeconomic conditions. Promising Research: Participatory action research, multi-purpose legumes, doubled up legumes, perennial grains, integrated nutrient management, sustainable intensification, ecological weed management, hydraulic lift, mother baby trials.